Beautiful. The photo plays like a song to me! Great macro with superb light and sharpness. 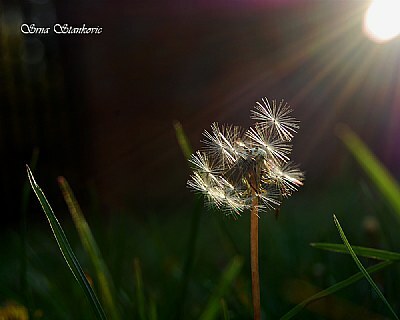 I love the way the sun rays shine on the dandelion. Great shot. Thank you so very much my dearest Paul. Thank you, Art, very much. Thank you, Nigel , very much. Thank you, Nandaji, very much. Thank you, Michele, very much. Thank you, Salvador, very much. Thank you so very much my dearest Jill. Thank you my dearest Marian. Stunning photography Srna. Great use of light and excellent composition. The details are just stunning! Your really making that Nikon D40 work girl! Fantastic visual and initial impact. Fantastic clarity. Excellent technique and technical excellence. Well deserved award! A light star illuminates a flower star. чио честитам Срна :-) art,. Stunning composition and admirable image, Srna. Very good photo.light work very well. Can see why you found this irrestible. Captured to perfection. Simpley exquisite. no one could resist this beautiful sight my dearest Srna!!! wonderful capture!!! light, dof all so fine!!! Thanks Paul on your nice observation. wonderful image my dear Srna, fantastic light, composition, DOF.